North and South Korean ships exchanged warning shots after a North Korean patrol boat crossed a disputed maritime border, say officials from the south. The incident happened around 10:00 local time (03:00 BST) on Tuesday, said South Korea's Yonhap news agency. It comes three days after North Korean officials agreed to resume high-level talks with the South. The two countries technically remain at war, after the Korean War ended in an armistice. 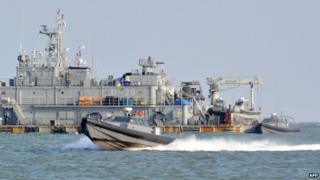 The incident reportedly took place near the border island of Yeonpyeong, according to the AFP news agency. A South Korea military spokesman said in a statement that they had sent "warning messages and fired a warning shot". He said the North had fired back, resulting in another exchange of fire, before the North's ship retreated. The BBC's Steve Evans in Seoul said that maritime skirmishes in the area are not infrequent. There was a similar one, with shots fired in a naval clash, two weeks ago. Sailors from both sides have died in clashes over the years. Our correspondent says the latest incident, while unlikely to derail the planned talks, underlines the dangerous nature of the relations in the heavily armed Korean peninsula.